The basilica of the Sacred Heart is one of my favorite places in Paris. In spite of the thousands of visitors every day, it is a quiet place where you can be soothed by the sound of rattling rosaries and the smell of burning candles. 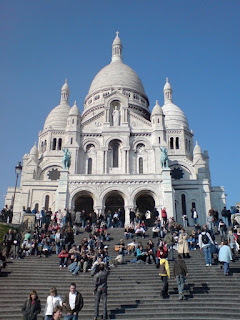 Many people have strong opinions about Sacre Coeur. Some find its Neo-Byzantine style way too much. Others find the devotion to the heart of Jesus to be antiquated and associate it with a pre-counciliar conservative brand of Catholicism. The Neo-Byzantine architecture that was so popular in France hundred years ago may be an acquired taste, but I find it charming and colorful. As for the devotion to the Sacred Heart, it is an ancient kind of spirituality and should not be reserved for the nostalgic or conservative. As a visitor you don’t have to have an opinion about either Neo-Byzantine architecture or Catholic devotions. You are free to enjoy the lively park that climbs the hill to the church, with its merry-go-round, the tourists and the pilgrims. You can take in the splendor of the exotic building, which might just as well have been located in India for all its oriental ambiance. As you walk around the ambulatory – the walk which passes all the little chapels that line the outer wall of the church – you can see hundreds of burning candles and people from all continents and walks of life. In front of the main altar is where the pilgrims come to talk from the bottom of their heart straight to the heart of Christ. If you come at the right time you can hear the Benedictine nuns sing their prayers. You are invited to sing along or just to pause for a while to enjoy the song and the serenity.